Spain will hold a general election on 20 December, with opinion polls indicating a tight contest between four parties for the largest share of the vote – the governing People’s Party (PP), who have a small lead in most polls, the Spanish Socialist Workers’ Party (PSOE), Ciudadanos (C’s), and Podemos. This article argues that Ciudadanos’ leader, Albert Rivera, is better placed than the leaders of the PSOE and Podemos to replace Mariano Rajoy as Spain’s Prime Minister. 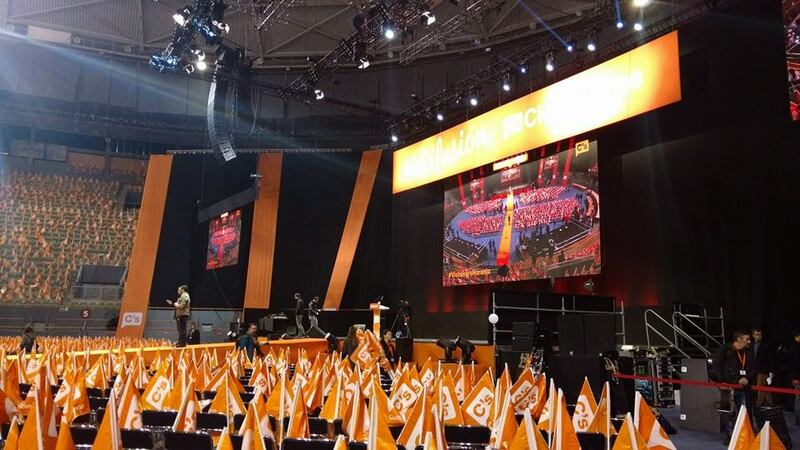 As anticipated in April, Ciudadanos have reached the final week of the campaign as a credible alternative to rule Spain and as the party most consider pivotal for the formation of the next government. Ciudadanos’ reformist agenda has granted them many sympathisers among disenchanted PP and PSOE voters. Their growth has been impressive; in less than one year, they have transitioned from being a Catalan party focused almost exclusively on a single issue – fighting against secessionist nationalism – into a national party which, according to the latest polls, could get between18% and 23% of the vote and even displace the PSOE in the second position after the PP. Good results in the Andalusian regional election on 22 March 2015 marked a tipping point in the trajectory of Ciudadanos, which was later consolidated and amplified after the results of the Spanish local elections on 24 May and the Catalan regional elections on 27 September. Ciudadanos have managed to overcome most of the organisational problems associated with a fast expansion and the criticisms that followed their electoral pacts with the PP and PSOE in many regional and local governments. The party’s charismatic leader, Albert Rivera, enjoys the highest approval ratingin Spain according to most polls. He has skillfully played to his advantage the important media exposure he has enjoyed over the last few months. Their political manifesto proposes liberal economic and labour reforms, fighting corruption, reaching a wide pact to improve the education system and guaranteeing the unity of Spain. Ciudadanos’ electoral pre-campaign and campaign have been planned, coordinated and supervised by Rivera and a small group of close collaborators which includes, Jose Manuel Villegas (Vice-Secretary General), Fernando del Páramo (Communication Secretary), Fran Hervías (Organisation Secretary) and Lula Bueno (Digital Communication). Rivera and several other prominent figures in Ciudadanos, such as Inés Arrimadas, Luis Garicano, and Francisco de la Torre, have engaged in dozens of interviews, public meetings, rallies, radio talk-shows and TV debates which have propelled the party steadily into the mainstream. According to most analysts and opinion polls their efforts have enabled Ciudadanos to reach the last week of the campaign in a position very few would have predicted just a few months ago. Mariano Rajoy’s PP continues to be the favorite in the electoral race. The latest polls estimate that they will obtain between 25 per cent and 27 per cent of the votes and about 120 seats in the Congress. Although the Spanish electoral system benefits the biggest parties, the PP will still most likely fall short of the 176 seats required for a majority government in Spain. The recent moderately positive economic achievements of Rajoy’s government have not managed to erase from the minds of Spanish voters all of the corruption scandals and unpopular measures adopted over the last four years. Indeed, Rajoy has the lowest popular rating among all of the candidates. 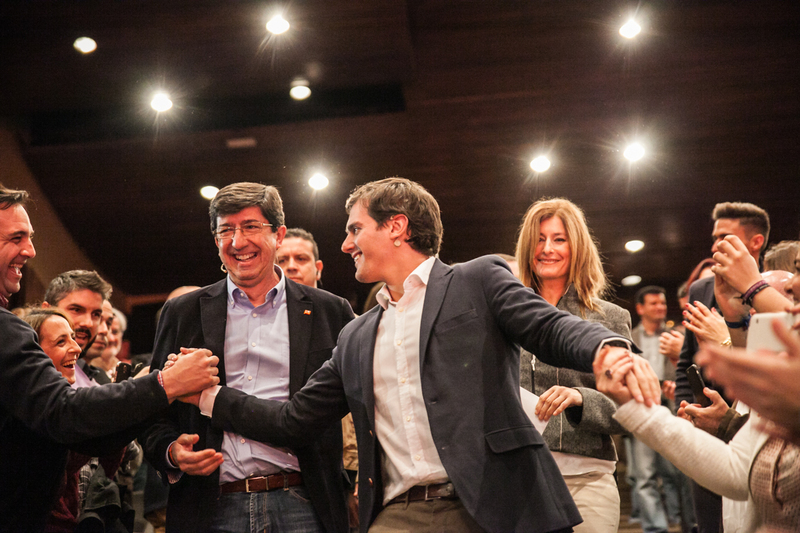 Most PP leaders and supporters hope to form a stable government by gaining support from Ciudadanos. They base their expectations on Ciudadanos’ willingness to negotiate with parties across the left-right ideological spectrum and on current pacts in several local and regional governments. However, this time it is likely that Ciudadanos will decide to adopt a different strategy. There are two main reasons why Albert Rivera may choose not to back a PP government. First, if Ciudadanos supports an unpopular new PP administration they will be punished by voters. Rivera has already announced that he would not enter a coalition government led by Rajoy, Sánchez or Iglesias. Ciudadanos could facilitate a Rajoy government by abstaining in a second vote in the Congress (which requires only a plurality of votes). However, this choice would still compromise the future of the party by hindering their credibility in an eventual opposition role, and, most importantly, by damaging their credentials as a centrist party that wants to change politics in Spain. Second, Rivera may have the real possibility of leading a new government himself. It is unlikely that Ciudadanos will beat the PP in votes, and the likelihood of gaining more seats than the PP is even more remote. However, according to the latest trends in opinion polls, there is a significant probability that Ciudadanos could overtake the PSOE as the second party in vote share (less likely in terms of seats). This scenario would grant Albert Rivera the legitimacy to attempt to form an alternative government to Rajoy. Why could the PSOE and Podemos back Rivera as Prime Minister? Ciudadanos have very little to win from joining a Sánchez or Iglesias-led government or coalition. Pedro Sánchez would initially be reluctant to support a Ciudadanos-led government, in particular if the PSOE have more seats than the centrist party. However, the alternative to a Rivera-led government, in the scenario polls suggest, would be another government led by Rajoy or new general elections, in which the PSOE would probably be the party that suffers the most. Sánchez may well receive strong pressure from within the party in such a scenario to go for the ‘second best’ option and facilitate a government under Rivera. The ousting of Rajoy is a core driving principle in the PSOE’s campaign. A large majority of PSOE voters would rather see Rivera than Rajoy as PM and may appreciate if some PSOE figures lead key ministries in an eventual coalition government. Moreover, Susana Díaz’s government in Andalusia could be jeopardised if the PSOE rejects a pact with Ciudadanos. Ciudadanos might therefore be in a position to offer the PSOE an honourable way out of a difficult situation. Denied the possibility of a left-wing coalition (with the PSOE and IU), backing a Rivera-led government has some clear advantages for Podemos. A Ciudadanos or Ciudadanos-PSOE government would be better regarded by Podemos voters than a PP government. Podemos could claim to have contributed to the defeat of the right and bi-partisanship in Spain. In exchange, Ciudadanos could agree to implement some reforms Podemos have been long requesting, such as a new electoral system. Moreover, Albert Rivera earned much of his reputation working in the opposition in the Catalan Parliament. With Rivera in government, the visibility and impact of Podemos as an opposition party would grow significantly. They would stand to capitalise on much of the discontent against that new government and consolidate the party as the clearly defined left-wing alternative for future elections, in particular if the PSOE also enters the government. For instance, over the last few days, attacks on Ciudadanos have intensified. A policy proposal to reform domestic violence regulation sparked criticisms from most other parties, which have been amplified by the press. The full impact of this ‘crisis’ on Ciudadanos’ support won’t be known until the election night. Likewise, the consequences of the latest TV debate between Mariano Rajoy and Pedro Sánchez could either steer many voters back to the PSOE or deepen its loss of support. The stance of the media can also contribute to shaping events. Political analysts in the Spanish press, TV and radio are starting to make more explicit their support for their favorite candidates. The two traditional parties tend to gather more media endorsements than new challengers. Finally, there is still a very high percentage of undecided voters who could opt for any of the available parties. Ciudadanos may have found in Podemos an unexpected ally. A limited transfer of votes from the PSOE to Podemos may be key to opening up a scenario in which Ciudadanos ends the race in second place and Rivera becomes the next Spanish Prime Minister. Podemos, when including the coalitions the party has integrated with in several regions, and the PSOE could also end up ahead of Ciudadanos. However, even in fourth place, Rivera’s party would play a crucial role in the election of the next government due to their centrality in the ideological spectrum. Ultimately, Ciudadanos are here to stay, and alongside Podemos they have the capacity to shake the foundations of the Spanish party system. On 21 December, the negotiations to form a government among the four parties could well herald the beginning of a new era in Spain’s democracy. Dr Jose Javier Olivas is an Associate to the Civil Society and Human Security Research Unit at the LSE, a co-Editor of LSE Euro Crisis in the Press blog and Director of the online voting and debate platform netivist.org. This entry was posted in Elections, Jose Javier Olivas, Spain and tagged Ciudadanos, elections, Podemos, PP, PSOE, Spain. Bookmark the permalink. I like Jose Oliva’s style of interpretation. Let’s have more articles Jose!